I think a lot of people will agree with the sentiment that happiness is viewing 2016 in the rear view mirror. I won't go on about real life; I think enough people outside gaming have already done so. Instead I'll take a quick look at gaming, or at least what has seeped into my awareness. One part of EVE I don't think the New Player Experience teaches new Minmatar pilots are all the factors that reduce the amount of damage artillery and autocannon do compared to the amount listed in the fitting tool. I did one of the COSMOS missions in my Rupture yesterday and experienced the variation first hand. As an experienced player I had fun playing with the variables and experimenting with the way I flew my ship to maximize the damage I dealt. I never realized how much I could increase the damage from a set of artillery just by turning off my afterburner. Or how turning on my afterburner could really increase my damage output. Transversal velocity in EVE describes the speed at which an object moves perpendicular to you, i.e. its orbital velocity. In other words, it is a metric used to describe the sideways movement of you and an object relative to one another. To get an sense of what this means, below is a list of some examples. The transversal velocity is computed by subtracting the two velocity vectors (i.e. both magnitude and direction) from one another, and then finding the length of the vector. This differs from angular velocity (below) in that it is not affected by the distance between both objects. My Rupture is set up to kite NPCs at a distance. Artillery doesn't have the best tracking, which means a smaller, fast ship is harder to hit. A way to maximize the damage is to reduce the transversal velocity by getting the NPC to directly follow the ship. I discovered that frigates were difficult if not impossible to hit if flying perpendicular to the NPCs flight path (or "crossing the T" in naval parlance) at full speed. But once I turned off the afterburner, I started hitting the frigates trying to close in. Just that reduction in speed lowered the transversal enough to allow me to start blapping NPCs. Angular velocity describes in EVE the speed at which you and an object rotate around each other. It is measured in radians per second, with π (3.14) radians equal to 180 degrees. For example, if you have an angular velocity at 6.283 rad/sec, then you are orbiting a full circle every second (since 6.283 = 2 * PI). Angular velocity has a very important relationship with transversal velocity. People often debate between using either transversal or angular velocity in an overview setup. Both variables display similar information; however, angular velocity is much more useful in practice, due to its use in turret to-hit calculations. It essentially allows for an easy comparison between your (or your opponent's) turret's tracking speed and the angular velocity. If the angular velocity is greater then the turret's tracking speed, you'll begin to miss, but having a smaller angular velocity than the turret's tracking speed means maximizing the hit chance. I did warn that math was involved. Basically, the above passage indicates that the effects of transversal velocity are minimized by distance. The farther away the ships are, the lower the angular velocity. Or in simpler terms, bigger ships can't hit small ships if they get close enough. Or small ships get easier to hit by bigger ships the farther away they are, at least until the falloff modifier overtakes the velocity modifier. I should add one qualifier about the angular velocity information. Due to a change in April, the module information no longer lists the turret's tracking speed. I see a number listed as "Turret Tracking", but have no idea how it relates to any of the information listed in the overview. I just try to kite the NPC's and let the principles about angular and transversal velocities take care of themselves. Or, in other words, I fly by feel and experience. The important takeaway is that the damage in a fitting tool is the maximum possible, not what one will obtain in space. Good flying and proper fitting can make a ship perform near those levels. In other words, EVE isn't just about the skills in your head, but the skills at the keyboard as well. 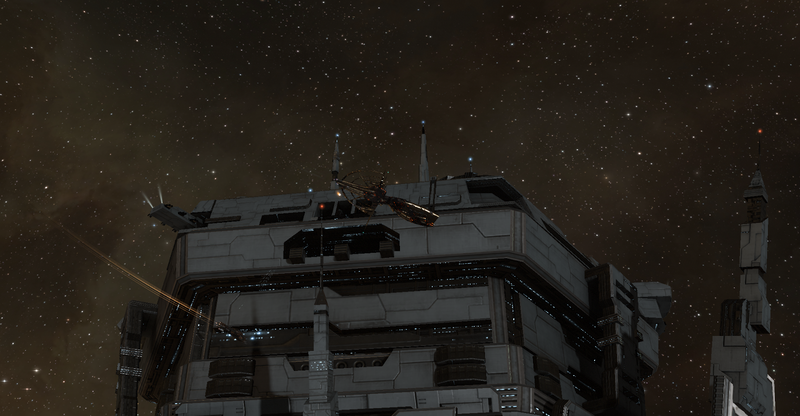 One of the interesting parts of playing an Alpha clone in EVE is ship fitting. I can find a lot of existing fits using skills all trained to level 5, but Alphas can never have those skills without paying a subscription. I'm not the greatest, but the chance to play around and then immediately test on a low skill character is fun. My schedule over the weekend changed a bit for a couple of reasons. The first was due to the bitter cold yesterday that pushed all my activities to Saturday. The other was I picked up an Oculus Rift. I have a Gear VR, and the Oculus Rift is definitely an upgrade. About the only drawback are the cables running from the headset to the computer. With a Gear VR, the Samsung phone fits in the headset, allowing freedom of movement. Another drawback is that my video card only has one HMDI port and no VGA port. I thought I needed to go back to Best Buy, but I finally found an adapter. I still intend to go back and pick up a real cable as a permanent solution, though. The store didn't have any of the Touch controllers, which is probably good for my wallet. Not only because I did not spend an extra $200, but because all the cool new games seem to require the new controller. I'll probably get a set next year, but that depends on the games compatible with the Xbox One controller. I know a lot of people complained about having an Xbox One controller come with the Oculus Rift because they already owned an Xbox. As someone who has never owned an Xbox console, the inclusion saved me some money. The one thing I feared is that my unfamiliarity with the controller would hamper using the system. So far, the games I played only use a couple of buttons and/or triggers, although I did forget the buttons on one of the games after just 24 hours. I found the headset itself light and comfortable. Well, once I started playing anyway. The straps do get a bit distracting until the headset settles in, but I normally don't notice once I start playing. I should add I played for up to 90 minutes with no soreness in my neck or head. The sound system also works well, which helps with the emersion into the game worlds. I started looking for audio experiences like Oculus has available for the Gear VR. I didn't find one, but maybe looking through the store is easier at the keyboard instead of while wearing the headset. As for the games, I only played two this weekend. The first was Lucky's Tale, a cute little VR platformer that comes with the Oculus Rift. The point of view sometimes is awkward, but after I got used to the angle, I came to appreciate it. The character you control, a fox, is also pretty cute. I'm someone who generally shies away from platformers, but I enjoyed clearing the first chapter of the game. The other game I played is one I own on the Gear VR, EVE: Gunjack. At $9.99, I think the game is a good buy. Gunjack reminds me a bit of Galaga, with an EVE flavor. I know, power-ups in a game in New Eden? But the game works, especially with familar weapons like smart bombs, lasers, and missiles. As one might expect when comparing a game running on a smart phone vs a computer, the graphics are a lot better on the Oculus Rift. I also like the simple control system that only uses the two triggers plus the X button. After the first couple of days, I'm happy with my purchase of the Oculus Rift. I still need to explore the store and find apps and games I like, but at least the gear itself works okay. I may write about my VR experiences in the future. I think everyone has low level NPCs they remember because they posed a significant roadblock to advancing through the game. In World of Warcraft, that character was Hogger, a level 8 gnoll. In EVE, the roadblock was a rogue member of the Society of Conscious Thought, Dagan. Dagan is the end boss of the Sisters of EVE level 1 epic arc. Capturing Dagan gives a nice standings boost to one faction every three months. But the first time I ran into Dagan while flying a Rifter, he scarred me for life. Normally I go back and take care of him while flying a Vagabond. But my brand new Alpha clone doesn't have the luxury of flying any type of cruiser, much less a HAC. 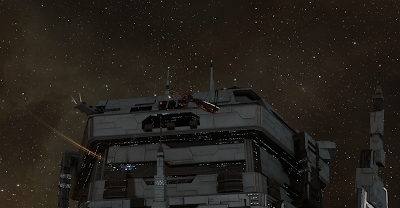 Worse, she needed the ISK. I decided not to try the epic arc until I could fly a well fit destroyer. Three weeks into the Alpha experience, I could finally fly the Thrasher I earned from a career agent well. The fit I used in the battle against Dagan is below. In the low slots, I used a Damage Control II for the bonuses to shields, armor, and hull, as the Thrasher really needs some help with the tank. I also used a gyrostabilizer because I knew I needed to throw as much damage at Dagan as possible. I started the arc with a tech 1 meta module and only fit the tech 2 version on the last day as I finished training Weapons Upgrade IV. In the mid-slots, I fit a meta afterburner along with a medium shield extender and a Medium Ancillary Shield Booster. I used the Medium Ancillary Shield Booster because I had cap issues when using a normal shield booster. The cap boosters for the module were cheap and small, so why not? I used 150mm autocannon instead of trying to squeeze in 200mm autocannon on the theory that the smaller weapons track better, so would apply more of their paper DPS in an actual fight. In the utility high, I threw in a Salvager I because I needed to loot everything for the money. The rigs I think are pretty standard. The Anti-EM Screen Reinforcer plugged the EM hole in the shields, the Core Defense Field Extender provided more shields, and the Project Collision Accelerator increased my DPS. I carried the three types of short range ammunition in my cargohold, switching out depending on the NPCs I faced. Instead of trying to determine what faction needed which type of damage, I developed an easier way. It the NPC ship had a golden or blue background, I loaded EMP S. If the background was green, I loaded Phased Plasma S. And if the background was red or rust colored, I used Fusion S. The colors of the ammunition even matched the background colors of the NPCs. The only NPC that didn't fit the pattern was Dagan, as he flew an SoCT cruiser. For him, I used Phased Plasma S, as I figured he needed to die in a fire. The actual battle was somewhat anti-climatic. Dagan had three wingmen, each flying a different faction's ship requiring different ammunition. What I did was pretty basic. I decided to fly under Dagan's guns and while orbiting the cruiser take out the frigates his wingmen flew. I took some damage in the beginning, but once I started orbiting Dagan at 1000 meters, I no longer needed to worry about the cruiser's weapons. Then all I had to do is pick off the frigates. One that was accomplished, I just orbited Dagan, firing all the time until he exploded. I did the entire 50 mission arc in approximately 10 hours spread over 6 days. Even after deducting for costs like skill books I needed to learn to fly a cruiser, my wallet still wound up 20 million ISK richer after I finished selling all my salvage. I'm not at the point of trying to PvP in faction warfare, but I am in a place I can start trying to hack data and relic sites in low sec. I currently have 33.5 million ISK and my Probe fit only costs 1.1 million ISK to replace. Time to start earning some money, because high sec simply doesn't offer a path to riches. 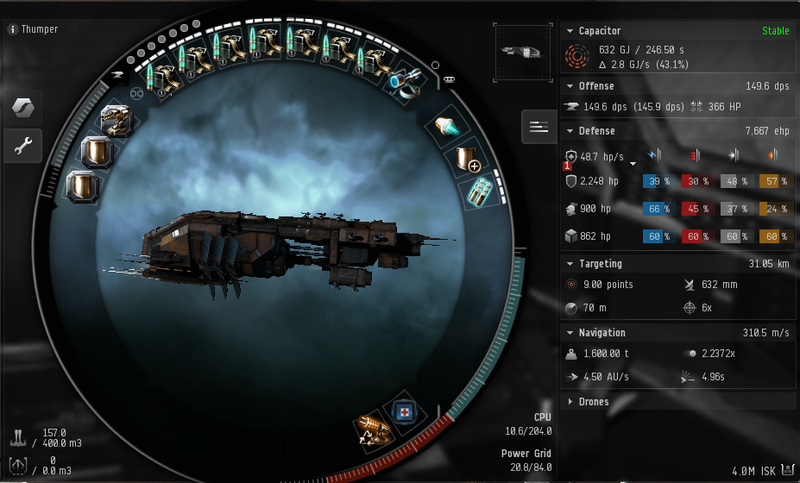 CCP hf, the Icelandic game developer that created the cult classic Eve Online game, is exploring strategic options including a sale of the business after receiving interest from potential bidders, according to people with knowledge of the matter. The closely held company’s owners, which include European investor Novator Partners LLP, U.S. investment fund General Catalyst Partners LLC and venture capitalist New Enterprise Associates Inc., are discussing whether or not to proceed with a sale, the people said, asking not to be identified because the deliberations are private. A sale of CCP could value the business at as much as 900 million euros ($955 million), the people said. Through the first few read throughs of the article, I couldn't quite believe the numbers in the article. Was CCP really valued at $300 million in November 2015? Are prospective buyers actually offering up to $955 million? The figures sounded like person or persons unknown spreading misinformation about CCP to a gullible press. So does the Bloomberg story have any basis of fact? I figured the easiest way to determine the validity of the story was to look at the valuation of CCP the parties used when New Enterprise Associates and Novator Partners gave CCP $30 million USD. But in looking back, I realized the story involves more than just a simple calculation. One of the interesting things of playing a new alpha clone is encountering problems that a 150 million skill point character can easily sweep away. I encountered one of those situations while attempting to complete a level 1 COSMOS mission this week. The agent, Tzumi Pokkolen with the Poksu Mineral Group, wanted 2 Sleeper Foundation Blocks. I had an autocannon-fit Thrasher. Easy, right? Tzumi sent me to the neighboring system of Inder and its Contested Minmatar Military Depot Complex. I needed to enter the Ancient Wreckage dungeon and hack containers with a Relic Analyzer until I found the two items required. Oh, and the NPCs respawn fairly quickly. But an autocannon Thrasher can put out a lot of damage, so no problem. Or so I thought. The plan almost worked to perfection. I rushed in, blapping the ships rather quickly. Even the cruisers. Did I mention the cruisers? Anyway, I managed to clear an area and hack a can. Then I started on another, and the alarms started going off. My tank started to break and I warped off with only one block in my cargo hold. I made three additional attempts, but each time the NPCs forced me to warp off. Okay, so the NPCs had the range advantage on me, and I didn't have a strong enough tank. Time to change strategy. Instead of brawling, I would snipe away from a distance. I didn't have enough skills to shoehorn artillery into the Thrasher, so I loaded up my skill queue with missile skills and bought a Talwar. The missile destroyer worked almost as advertised. With an armor tank featuring a reactive armor hardener and a tech 2 armor repairer, I just needed to plink away at range and then rush in to hack the cans. I think the plan would have worked if I could fit a microwarpdrive instead of an afterburner. As it was, the NPCs couldn't make me warp off, but they would make me back off right before I could begin the hack. I played that game for 30-40 minutes before a Rupture warped in, asking if I needed a hand. Yes I did! He pretty much drew aggro expect for a group of four frigates that respawned between me and him. Four frigates I could handle, and I found the block in the first can I hacked. I thanked the Rupture pilot in local and warped off. If I played on one of my main characters, I would fly into the room in something like a Stratios, drop a flight of drones, and hack to my heart's content. But on a new character, I don't have the luxury of overpowering the content. On an alpha character, I don't even have the option of changing to another faction's ships. Perhaps one day my alpha character will own a ship capable of holding up under the pressure and able to hack all the cans. But until then, I need to find a more productive activity. The COSMOS missions are tough. Tomorrow marks the end of the third week of the age of Ascension in EVE Online. More importantly on a personal level, I'm coming up on a decision about the future of my alpha character, Krasiva Pesen. Krasiva began as an experiment into the viability of playing an alpha clone. Except for the half-speed training, I haven't experienced much of a difference from normal play. But the half-speed training is starting to come into play. When some of the level 3 skills take 14 hours to train and level 4 skills are taking, in some cases, 5-9 days to train, the training is painful. The good feeling of learning a couple of skills a day will soon end. I'm currently training level 1-2 missile skills, then the cruiser skills, but after that, the progression really slows down. 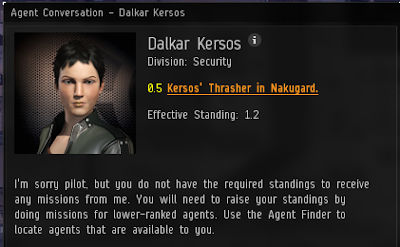 With only 850,000 skill points and 15 million ISK, Krasiva is still a very young character. But at the three week mark, I need to decide if I should end the experiment and return to my accounts I currently pay for. That's the rub, at least for people with paid accounts. Our accounts still train, but how long do we pay for them without playing on them? For myself, a natural decision point occurs in two weeks. Currently on my third account, I have a character that finishes the training necessary to run a data core farm, then she goes on to another area of study. The account also has an empty character slot. The perfect time to begin a new character. One thing I learned about myself with my alpha clone experiment is that I'm ready to begin a new character. But I don't like the limits of the alpha clone, especially the reduced speed training. I like to log in and see the list of skills I trained. With my main characters on training paths learning 20 day skills, I forgot how much I missed hearing Aura say "skill training complete". So do I continue with the alpha clone, start up a new omega clone, or go back to playing my main characters? Krasiva faces a challenge I need to complete, so I will put off a decision until then. But if I have everything figured out, I complete that challenge tonight. Right now, I'm leaning toward returning to my paid accounts. Playing on an alpha account is fun, but if I'm paying $33 a month for a game, I want to play the full game and not the reduced version the alpha account represents. Sometimes, a plan just doesn't come together. Case in point, my plans for my alpha character. At first, everything worked great. The new NPE, which I'm now learning to call Inception, the career agents, and then the grind to 1.0 standings with the Minmatar Republic in order to run level 2 missions with the Minmatar. All of this leading up to running through the COSMOS missions. The prospect of getting faction blueprint copies had visions of ISK dancing through my head. The first obstacle I encountered involved trying to get a mission from a level 2 agent. I received the brushoff. What? I don't have the standings? But no, that is not the message the agents give when the issue is insufficient standing. This is. Dalkar Kersos is a level 3 agent, so the message made sense. But getting rejected by a level 2 agent? I still can't figure out the problem. Then the problems got a little worse. I gave up on these agents and went to the Sanctum Psychosis in Lanngisi. I received a 3-run blueprint copy of a 250mm 'Jolt' artillery cannon. That's when I discovered alphas cannot manufacture any of these meta modules, as they require omega clone skills. What's worse is I can only create one contract at a time. So even selling the BPC is difficult. I really thought I had an alternative way to make ISK that would immerse me into the lore at the same time. Looks like I need to come up with another plan.